The Muny is 100! A summer tradition that generations of St. Louisans grew up with, the Muny has endured many changes over the years, but in 2018, it’s still here and it’s thriving. And now, the Muny has kicked off its centennial season with a gala extravaganza that celebrates its history as well as–both intentionally and unintentionally–demonstrating some time-honored Muny traditions, such as how to deal with rain delays. Note the date I’ve listed at the top of this article. That’s not the published date for this extravaganza. In fact, the lavish centennial celebration dinner did take place on the advertised date of Friday, May 18, and every effort was made to stage the show, as well. As the thousands of attendees took their seats and waited, the Muny’s technical crews did their best to ready the stage for the event during a brief respite from the rain that had been drenching St. Louis essentially all day. There was hope, but alas, the rain started up again, and Executive Producer Mike Isaacson ran onstage to make the announcement that the show would have to be postponed until the next night–Saturday, May 18. So, at the same time one day later, the crowds returned and the show went on, but not without a few more weather-related hitches. The show started on time, but the unpredictible St. Louis weather made for two rain delays lasting about 20 minutes each. Still, even with these stoppages, the show started strong and didn’t lose its momentum. It was a treat from start to finish, bringing back some Muny favorites and legendary stars as well as highlighting frequent Muny ensemble members and the Muny Kids and Teens. “An Evening With the Stars” was no exaggeration, with a stellar lineup hosted by Broadway star Heather Headley, who has appeared at the Muny as the Witch in Into the Woods, and Broadway and TV star Matthew Morrison, who is perhaps best known for Glee. These two served as presenters for the event and also got their moments to shine, with Morrison leading a fun production number featuring a condensed version of the musical Hairspray, and Headley bringing down the house with her powerful vocals on a medley from Funny Girl. There were also standout performances and stories from Patrick Cassidy, who sang “Till There Was You” from The Music Man alongside fellow Muny alum Jenny Powers, as well as recounting a story from the filming of the movie that starred his mother, Shirley Jones, who also sent along a video greeting. There was also a stirring rendition of “Memory” from Cats by beloved Muny favorite Ken Page, an energetic ensemble tap number of “We’re In The Money” led by Lara Teeter, and Graham Rowat leading the entire cast in singing “The Quest (The Impossible Dream)” from Man of La Mancha. Other memorable segments included two songs from the classic A Chorus Line–“What I Did For Love” sung by an impressive group of longtime Muny veterans and regulars, and then the grand finale, a spectacular dance to the showstopping “One”, featuring energetic dancing and well-timed fireworks from behind the stage and from the sides of the auditorium itself. It was a truly stunning conclusion to spectucular show. As wonderful as the whole show was, though, I think special note should be made of two legendary performers who commanded the stage with stories and songs, demonstrating the longevity of their extraordinary talents. I’m referring to the truly superb Chita Rivera and Tommy Tune, who proved that even after decades in the business, their remarkable talent, energy and stage presence are still very much in evidence. The 85-year-old Rivera and 79-year-old Tune–who both starred in Bye Bye Birdie at different times but never together–treated the audience to a delightful rendition of the show’s last scene and the song “Rosie”, showing excellent stage chemistry in the process, and expert, energetic tapping from Tune. Rivera also had a great moment telling stories from the making of the original production of Chicago and singing the signature “All That Jazz”, and although the choreography has been simplified, her attitude and style are still there in force. For me, a lifelong theatre fan who had never before been given the opportunity to see these great stars live, their performances were the clear highlight of the already stellar production. The techical values of this event were also impressive, with direction by Matt Kunkel, music direction by Michael Horsley, and Choreography by Michael Baxter. The set by Paul Tate dePoo III was simple but elegant, and the costumes by Robin L. McGee and hair and makeup by Kelley Jordan sparkled and dazzled. There was also exellent lighting and video design by Rob Denton, Nathan W. Scheuer, Matthew Young, and Shelby Loera. It was a great looking, great sounding, star-studded production that’s fitting of a 100-year anniversary celebration for such storied St. Louis institution. The big show was only part of the celebration, though. In addition, the Muny hosted a “Birthday Bash” open house event on Sunday, May 20 featuring many free events that allowed the St. Louis public an even closer look at what makes the Muny so distinctive. With historical displays, vehicles that were used in various shows such as the Jeep from South Pacific and a Ford Model T car from Thoroughly Modern Millie, as well as showtune karaoke, a ferris wheel, and a fascinating backstage tour and opportunity to step on the famous, enormous Muny stage, it was an excellent way for the Muny to share even more of its rich history with its audience. 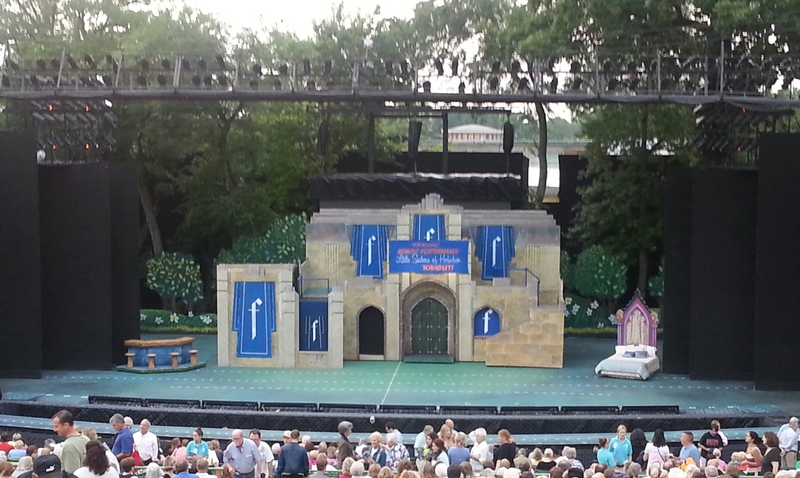 The Muny has gotten off to a great start celebrating 100 years in Forest Park. Next on the schedule: its much-anticipated 100th season of musical theatre, which begins soon, on June 11 with the Jerome Robbins’ Broadway. Rodgers and Hammerstein’s Carousel is often considered one of the best musicals of the 20th Century. It’s also a show that I love, even though I had never seen it live before. Now, a somewhat unlikely company has produced it here in STL. I had never seen a show at Union Avenue Opera before either, but now they have ventured into the area of musicals and I’m glad they have, because this production is excellent, especially in the area in which one would expect an opera company to excel–the singing. Carousel tells the story of the unexpected romance between carousel barker Billy Bigelow (Wes Mason) and textile mill worker Julie Jordan (Maria Lindsey) in a small Maine fishing town. Julie’s friend, Carrie Pipperidge (Christine Amon) takes up with upwardly mobile fisherman Enoch Snow (Anthony Webb), but Julie and the aimless Billy struggle in their new marriage, and when Julie announces she’s expecting a child, Billy is driven to desperation in order to provide, teaming up with disreputable sailor Jigger Craigin (Andrew Wannigman) for a nefarious, risky scheme. When Billy’s plans don’t go as expected, he gets a chance to redeem himself somewhat, in trying to help his confused teenage daughter Louise (Caylee McGlasson, danced by Emma Gassett). This is a dramatic story with some romantic elements and glimmers of hope, but also with a dark edge and some controversial subject matter along with Rodgers and Hammerstein’s striking, melodic score. The production here is well-cast, especially in terms of vocals. Mason and Lindsey make a convincing pair as Billy and Julie, with powerful voices and excellent chemistry especially in their celebrated duet “If I Loved You”. Mason does a good job with the difficult role of Billy, whose choices are problematic to say the least, and Lindsey makes a somewhat aloof Julie, which works for the character, especially in the later scenes after the time jump in Act 2. There are also some glorious vocals from Merry Keller as Julie’s cousin Nettie Fowler, who sings the anthem “You’ll Never Walk Alone” and the boistrous “June Is Busting Out All Over” with convincing power. Acting-wise, the standouts are Amon as the loyal and occasionally giddy Carrie, and Webb as her enterprising but sometimes emotionally clueless beau Mr Snow. These two have excellent voices, and marvelous chemistry as well. There are also strong turns from Wannigman as the menacing Jigger, Debby Lennon as Billy’s jealous, possessive employer Mrs. Mullin, and Robert McNichols, Jr. in three pivotal roles. There’s also some excellent dancing expertly choreographed by Yvonne Meyer Hare, particularly in the ballet sequence danced beautifully by Gasset as “Dance Louise” and the excellent ensemble. There is also, as to be expected, beautiful ensemble singing and a superb orchestra conducted by Scott Schoonover. It’s a score that tends to the operatic in many instances, and this opera company does it justice. Technically, the production is a little different than most other modern musical stagings, especially in the area of sound. The individual performers are not mic’d, so sometimes the speaking lines can be difficult to hear, although most of the cast members project their voices well enough. There are also supertitles–designed by Philip Touchette– projected on the wall to help the audience to follow the dialogue and story. The set by Patrick Huber is appropriately detailed and evocative, as are Teresa Doggett’s costumes, although the style seems to suggest a combination of different 20th Century eras rather than the usual Turn of the Century setting. There’s also excellent atmospheric lighting by Huber that helps to create and maintain a stylized, almost otherworldly tone to the proceedings. Carousel is an ideal first venture into musical theatre for Union Avenue Opera, and I’m glad I was able to see it handled so well and in such a fine, musically stunning production. There’s also something of an air of the “old-fashioned” here in terms of staging, and I mean that in a good way. It’s an especially strong production and well worth seeing, and hearing. Union Avenue Opera is presenting Carousel until August 5, 2017. Ken Page is something of a living legend in St. Louis theatre. A veteran Broadway actor and singer, Page has become a fixture at the Muny and in the local theatre community, especially since moving back here to his hometown a few years ago. Page has now taken much of his own memory and life experience, as well as the stories of friends, and portrayed them in a new play, Sublime Intimacy, which is currently being presented in an impressive, ambitious staging by Max & Louie Productions. Page, who also directed this play, explains in his directors’ note in the program that he was inspired by the stories of friends over the years who have relayed their stories of searching for, and occasionally achieving, a level of connection and intimacy that goes beyond the sexual into a more spiritual and emotional level. That’s the “sublime intimacy” of the play’s title, and Page’s stories revolve largely around dance. Using one dancer (Alfredo Solivan) to portray several different characters representing the “muse” or “ultimate love” or “unattainable ideal” of various figures in the play, Page relates the stories as narrated by his obvious fictionalized representation, Tim Pace (J. Samuel Davis). He takes us into the world of actors and artists in early 1970s St. Louis, 1970s and ’80s New York, Los Angeles in the 1940’s and 1990’s, along with a brief trip to Paris in 1980 and a return to St. Louis in the early 2000’s. He follows a group of gay men including the initially troubled young artist Gene Donovan (Michael Cassidy Flynn) and his intellectual friends Don Taylor (John Flack) and Bill Ross (Reginald Pierre), as well as other friends also played by Flack and Pierre at various moments in time. There’s also Katharine Reilly (Bethany Hart), a theatre teacher and actress who seems to find herself frequently falling in love with gay men, including her childhood friend Michael, represented by Solivan who also portrays Gene’s artistic “muse’–a Washington University dancer named Steve, as well as important figures in stories told by Don and later Tim. Perhaps this play’s greatest strength is its extremely vivid sense of time and place. Page deftly transports his audience back to the St. Louis academic community in 1972, as well as to its other times and cities with vivid description and characterization. Especially powerful are the experiences of Gene, a young gay man learning to accept his sexuality, as well as Don, an older gay man remembering what it was like to be a Hollywood movie extra in the 1940’s with a strong attraction to a dancer from a movie filming at the same studio. Katharine’s stories, that interweave with those of Gene and Tim, are also memorable, as is Tim’s brief interaction with a dancer he meets in Paris. The dance sequences are beautifully danced by Solivan, who makes a believable representation of the various objects of affection, desire, and inspiration for the characters. Sometimes the play tends to get a little talky, but for the most part it’s a fascinating trip through time, place, and imagination, anchored by some excellent performances–especially by Davis, Barr, and Flack, who has perhaps the most memorable and sensitively portrayed moments in the play recounting his Hollywood story. Technically, the production is imaginative and cleverly staged, with a striking, versatile set by Dunsi Dai. There are also marvelously evocative period costumes by Teresa Doggett, and a truly excellent use of music, consisting of some popular music of the 1970’s and atmospheric original music by Henry Palkes. Patrick Huber’s lighting is also impressive, contributing a somewhat ethereal atmosphere to the production and helping to maintain the overall lyrical tone. It’s obvious from seeing Sublime Intimacy that Ken Page’s memory is vivid, as are his imagination and his artistic sensibility. This isn’t a flawless work–there are some moments that seemed slow at times–but for the most part it’s highly emotional, excellently acted, and fascinating to watch. It’s a strong original effort by Page and company, and it’s well worth seeing and experiencing. Max & Louie Productions, in association with Ken Page, presents Sublime Intimacy at the Kranzberg Black Box Theatre until December 20, 2015.